You may have palmoplantar pustular psoriasis if you are experiencing pustular-type blisters and scaling on the palms of your hand or on the soles of your feet. Of course, you need to get a true diagnosis, but sometimes knowing what you’re dealing with can help you know when it’s actually time to make that doctor’s appointment. The key to identifying pustular psoriasis is the small blisters, which are usually filled with pus. These blisters then turn scaly and brown, although if the scaling is very prominent you may only notice the redness and scaling. Be reassured that the pustules are completely sterile, containing no bacteria, thus they are absolutely not contagious. 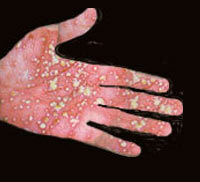 The blisters or pustules tend to appear in clusters, in waves, on the soles of the feet and palms of the hands. The skin may also thicken and develop fissures, or painful cracks in the red, scaly skin. What Causes Palmoplantar Pustular Psoriasis? 1. Stress – Avoiding stress as much as possible can definitely help avoid triggering psoriasis flare-ups. 2. Infections – Pustular psoriasis can be triggered by infections. 3. Pregnancy – Pregnant women tend to get flare-ups of pustular psoriasis. 4. Obesity – Doctors haven’t actually concluded that excess weight or obesity is the cause of psoriasis, or whether the psoriasis causes the obesity. However, those who are overweight do tend to have more severe cases of treatment-resistant psoriasis. 5. Smoking – Pack-a-day smokers tend to have more serious pustular psoriasis flares, which are also less likely to respond to treatments. 6. Alcohol – Drinking seems to cause flare-ups, which don’t respond as well to treatment. Additionally alcohol’s impact on psoriasis affects men more than women. 7. Sun – Overexposure to UV light can cause flare-ups of pustular psoriasis, so you should avoid sunbathing and tanning beds. Going for long walks, runs or other activities that put a lot of pressure on the bottoms of the feet will almost always aggravate pustular psoriasis on the bottom of the feet. For that reason, certain jobs may be of out of the question, including: dog walker, walking mail delivery, cashier, etc. Children’s skin disorders can often go undiagnosed, and instead may be treated as fungal infections. The type of arthritis, which often accompanies the palmoplantar type of pustular psoriasis, is often not identified as psoriatic arthritis. Treating palmoplantar pustular psoriasis usually starts with figuring out what is triggering the flare-ups. While you should consult with your physician about a treatment plan, there are a few steps you can take to help prevent and treat the psoriasis. 1. Moisturize – To prevent the skin from cracking, liberally apply moisturizer as often as possible. 2. Bathing – Avoiding strong or harsh soaps, use lukewarm water and a gentle soap, employing bath oils and or tar solutions to soften the skin. 3. Wear comfortable shoes, preferably those made of natural fibers.